Easter is the first Sunday following the first full moon that occurs on or after the day of the vernal equinox (the first day of spring). It can fall on any date (that’s a Sunday) between 22 March and 25th April. The most likely date is 19 April while the average date is 7th April. The date upon which it may fall straddles the day (21st of April) when the sun slips from Aires to Taurus. Statistically, Easter is much more likely to fall into Aries than Taurus. But this year, Taurus wins. In Old Testament times, at around Eastertime, priests would sacrifice lambs as an offering. When Jesus arrived, he became the sacrificial lamb – the ‘Lamb of God’. Blood purifies. The letting of blood expiates our sins. 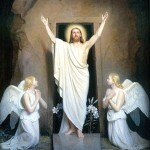 This is why Easter is associated with rebirth and resurrection. Easter is the time to atone for our transgressions and start over again, fresh and clean. With all the focus on bloodletting, it’s fitting that Easter usually occurs in Aries. Aries is an ardent, spirited energy. As the archetypal warrior, Aries is action-oriented and focused to win. But when Easter falls into Taurus, we’re introduced with a new kind of energy – solid, stable, secure, and settled. As the archetypal Earth Mother, Taurus gets back to basics. The Taurean platitude is ‘slow and steady as she goes’. So this Easter, why not take advantage of the shift from being active and outgoing to that of being more self-sufficient and serene. After all, you’re getting a second chance. You’re starting over. Why do it all the same again?